In a draft class that’s been touted as the Year of the Defenseman, it’s unlikely that Derrick Pouliot has been at the very top of many scouting report rankings. That said, he’s most definitely not flying below the radar. Every since becoming the first overall pick in the 2009 WHL Bantam Draft, the eyes of the junior hockey world have been fixated on Pouliot. In two full seasons with the Portland Winterhawks, he’s never looked out of place and has constantly improved since arriving in the Dub. Most notably, Pouliot has been lauded for his passing, which the WHL from Above blog describes as “sublime,” calling him the best defensive passer in this draft class. That’s pretty high praise considering it puts him above the Dumbas, Reinharts and Cecis of the world. Moreover, this improvement has resulted in more power-play time for him, which has also allowed him to improve his scoring numbers – his goal totals doubled this year over last, and his power-play markers jumped from one to six. His improvement earned him a spot on Team Orr at the CHL Top Prospects game, where he had an assist on the game-winning goal in the low-scoring affair. While Pouliot has many assets, there are a few factors that place him slightly below the other defenders in the draft. Like a lot of maturing defenders, he sometimes struggles away from the puck and is still figuring out exactly where he needs to be without the biscuit, especially in his own zone. In addition, some scouts noted he has issues with consistency, but not to the degree that it drastically reduces his effectiveness. While Derrick Pouliot won’t be the first defenseman chosen in the 2012 NHL Draft, it’s virtually guaranteed that he’ll be chosen in the first round. The main question marks surrounding him will be if he can continue to learn from his teammates and his own mistakes and continually improve, as he has done over his first two seasons in the league. If he can continue to progress, whichever team that chooses him will grab themselves a very effective, very valuable hockey player. 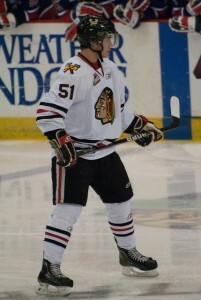 Pouliot played on Team Western Canada in the 2011 World Under-17 Challenge, contributing 3 points in 5 games. He also attended Hockey Canada’s summer camp for the Under-18 World Championships, but was unable to play in the tournament for Canada due to being still involved in the WHL playoffs. Brian Campbell with less size. Ranked 12th among North American skaters by NHL Central Scouting.